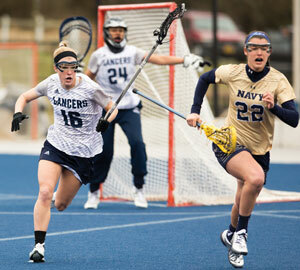 Shiloh McKenzie ’16 (left) netted Co-Defensive Player of the Year honors in the Big South. Longwood lacrosse will look much different in 2017 as the program bids farewell to a senior class that left its mark as one of the top cohorts in school history. The four members of the Class of 2016—Sarah Butler, Shiloh McKenzie, Katie McHugh and Lisa Schell— guided the Lancers to a four-year Big South record of 18-11 with two top-three finishes and brought in multiple conference awards in 2016. Among the award-winners was senior defender McKenzie, a criminal justice major from Lothian, Maryland, who was named Big South Women’s Lacrosse Co-Defensive Player of the Year to become the first Lancer in program history to receive Big South Player of the Year recognition. McKenzie’s award came after she caused a career-high 30 turnovers, scored a career-high 29 goals and finished fourth in the conference with 64 draw controls, all part of a breakout senior year that propelled the Lancers to an 8-10 overall record and a 4-4 mark in Big South play. Sarah Butler, an exercise science major from Melbourne, Australia, and her partner on the front line, Katie McHugh, a communication studies major from Burke, both joined McKenzie on the All-Big South team, with Butler earning first-team honors and McHugh receiving second-team recognition. Butler and McHugh put together two of the greatest offensive seasons in Big South history, both breaking the program’s single-season points record and ranking among the NCAA’s top 10 in points and assists. Both put their stamps on the Longwood record book, with McHugh finishing as Longwood’s all-time leader in points, second in goals and fifth in assists. Butler also finished among the program’s top five in points, goals and assists. Schell is an exercise science major from Spencerville, Maryland.